There are lots of reasons a business might not make it. Payroll could be the one that gets overlooked. Payroll services that provide workforce management software offer a competitive advantage. 20% of small business fail their first year. Payroll problems are the number one reason. Effective management of payroll can ease cash flow problems and ensure long-term viability. Business owners who hire experienced accountants enjoy the benefit of added experience. Professional small business accountants can help you avoid common payroll problems. Look for an accountant who is familiar with your industry. Seek recommendations from other business owners. Accountants for small businesses keep the books and file taxes. Professional payroll services are even more specialized. They handle the payroll process from start to finish. The success of your business depends a lot on how you work with these experts. Some payroll services offer services other than simple payroll processing. Paying your employees is the first priority of a payroll service. One of the reasons payroll services work for small business is the convenience. Running payroll is an administrative burden, and small companies don’t have extra time. Payroll takes time and requires specialized focus. Small companies working to get their start can’t afford the required resources. Employees working for smaller companies shouldn’t worry about payroll. Worry can cause productivity problems and low morale. With a professional payroll service, you never miss a payroll period. You will always meet your tax filing deadline. All you need to do is report your employees’ hours and the payroll services handle the rest. Outsourcing payroll services can protect you from payroll problems. But you have to provide accurate information. Workforce management software tracks employee time and attendance. System automation prevents many payroll problems. If you adopt workforce management software, make sure it is compatible with payroll. Otherwise, you’ll miss out on the efficiency gains these two systems provide together. Workforce management software includes scheduling, time and attendance, and document management. Look for workforce management software that includes mobile access and employee self-service, too. Workforce management software can help you solve these problems. Dedicated payroll services can work with your workforce management software. 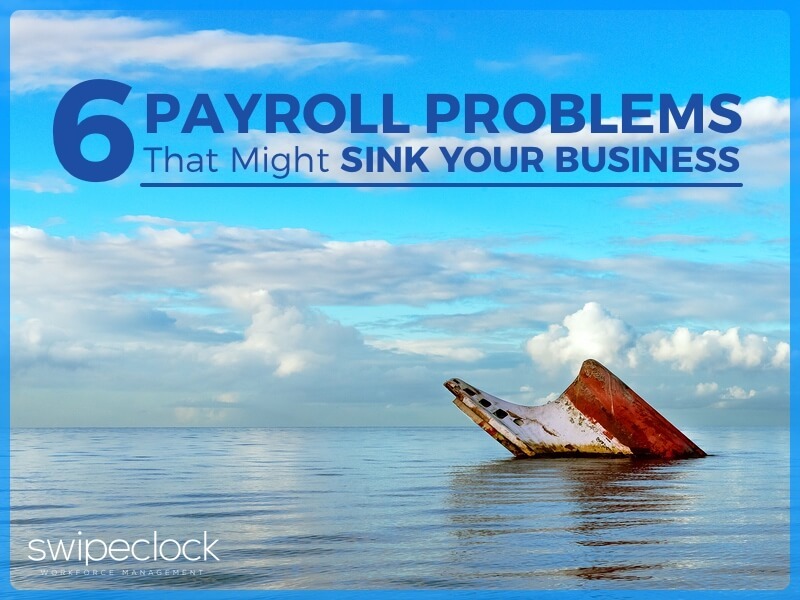 Together, these resources will help you overcome these common payroll problems. It’s called “human” error for a reason; humans make mistakes. Employees enter incorrect hours on paper timesheets. Employees forget to clock out for unpaid breaks. Mobile employees miss clock in and clock out. Supervisors fail to track over time. Even the most meticulous Human Resources managers make data entry mistakes. Employees do, too. An error isn’t an isolated event. It causes a domino effect. Incorrect hours lead to incorrect paychecks. Incorrect paychecks affect withholding and payroll taxes. Employees don’t like it when an error causes a shorted paycheck. The whole problem takes time for everybody. Then there are intentional human errors. Employees pad time cards to add hours to their paycheck. Supervisors hide overtime to meet department budget goals. There are a lot of motivations for fudging the data. Every time data transfers to a new system there is a window of opportunity for error. When managers commit paycheck errors on a large scale, it can result in huge fines. This is true whether the infraction is intentional or not. T.G.I. Fridays failed to pay employees for off-the-clock work. They also violated break laws. If that weren’t enough, they practiced illegal tip pooling. The result? A $19.1 million fine. There are scores of wage-hour law attorneys waiting to help employees who have a payroll claim. There is also an administrative burden to payroll errors. Each mistake takes time to correct. The payroll manager must investigate the mistake and track down the correct information. This usually involves talking to an employee or manager. This interrupts their day. Each of these players is on the clock. Human error is a clear and present danger. It adds to your labor costs and puts you at risk for business-sinking fines. Plus, it frustrates employees when there are problems with their paychecks. Payroll services integration with workforce management software can solve the problem. When these two systems work together, fewer errors can enter the system. Fewer errors mean time saved, fees avoided, and employees happy. And that makes managers happy, too. You have a deadline every pay period. Your employees need their checks on time. For small business owners, this seems to come faster every month. There are also federal, state, and local tax filing deadlines. Employers must submit business income tax and withholdings. Some of these deadlines vary depending on your business structure. There are industry-specific filings, as well. Tax filing extensions incur fees. Taxes already eat up enough profit. Few businesses can afford fees on top of taxes. Missing filing deadlines can also interrupt cash flow. When you have to double a payment due to a delay, you better have a cushion. It’s hard to meet budget goals when you miss tax filing deadlines. The need to file tax extensions is an expensive prospect that you can avoid. Payroll services can help you prepare in advance to avoid the fees, and save money on your taxes, too. What happens if you miss a payroll deadline? Employees lose motivation when they aren’t paid on time, and that affects customers. Employees who experience chronic payroll problems are more likely to file a report. Reports lead to audits, and if you are missing payroll, you aren’t going to pass an audit. Audits can result in fees and other penalties that can sink your business in a hurry. Payroll services with integration to workforce management software will help you manage better. Workforce management software integration means your data is accurate and up to date. Integration with payroll saves you time so you can meet deadlines. Together these systems can help you avoid audit trouble. In the event of an audit, your workforce management software provides detailed reports. Small business owners can protect against these problems by trusting professionals. Working with professionals is easier with workforce management software integration with payroll. Professional payroll services can save you more money than they cost. The same goes for workforce management software. This benefit is not always intuitive, but in the long run, it makes a lot of sense. There is nothing simple about compliance. This has been true for decades and there is no reason to think it will ever change. Entrepreneurs must enter business ownership with eyes wide open. Regulations exist for a wide range of business practices. Payroll is at the top of the list for many reasons. The Fair Labor Standards Act (FLSA) covers child labor, minimum wage, and overtime. There are Affordable Care Act (ACA) implications depending on the number of staff. In the healthcare industry Payroll Based Journal (PBJ) requirements dictate healthcare time recording. Family Medical Leave and Fair Scheduling laws protect employees from excessive work requirements. Though not law, union agreements can impose wage requirements and scheduling mandates. Many other industry-specific regulations from state to state deal with payroll services. Other requirements apply if you have non-U.S. citizens among your employees. The Department of Labor fines business of all sizes. Even small businesses pay fines that can sink a small company. Some employers have many layers due to differing state and local workplace laws. These are very complex and it helps to have a payroll services expert on your team. There can be a lot to worry about. Your payroll services provider has the answers. Two Marietta Georgia hotels paid $73,732 in back wages and liquidated damages to 14 employees. They violated minimum wage, overtime, and record-keeping provisions of the FLSA. A Newark New Jersey medical transportation company will pay $77,202 in back wages. They must pay an equal amount in liquidated damages, too. They owe 38 employees to resolve violations of the overtime provisions of the FLSA. Each law has associated record-keeping rules. Though an added burden, records are your best protection in case of a payroll dispute. Workforce management software can help you create and manage compliance records. In most cases, automatic time and attendance records are part of the system. Faulty record-keeping can result in a fine even if there was no violation. It pays to have a workforce management system for time and attendance data. Effective record-keeping is good a protection against labor penalties. Complete, searchable records are also an effective analytics tool that is often overlooked. Workforce management software helps you analyze company performance. Data from time and attendance can be helpful in optimization strategies. Advanced workforce management software present data in graphical formats. It reveals trends otherwise easy to miss. This data can be helpful in payroll processing but isn’t limited to this. Workforce management software provides insight into scheduling, payroll, and workflows. Business owners can use analytics to optimize everything connected to their employees. Since labor is your biggest expense, you would do well to spend time optimizing it. Compliance with legal requirements is easy with the help of professional payroll services. It’s even easier with integrated workforce management software. Audits and lawsuits can cripple a business. Especially when you are not prepared. Keeping good records can insulate you against audits, employee accusations, or regulatory penalties. Record keeping is an automatic function of workforce management software. Your payroll services advisor can use real-time reports to prepare for an audit. You can also use them to respond to an employee challenge. Employees should have access to their own records in your workforce management software. Employee self-service access can help you manage payroll by empowering employees. Empowered employees can solve smaller problems and relieve busy managers from interruptions. They can also access historical data that answers a complaint before it becomes an issue. Maintaining good records can help in other areas, too. Review historical data to spot opportunities for optimization. Optimization in scheduling and payroll can help you avoid audits. Using a cloud-based service that provides historic recording and backup is critical. Storing this data off-site means you won’t have to worry about disaster recovery. Cloud-based workforce management allows you to share data with your payroll services provider. This gives you real-time access to both your trusted payroll services advisor and your data. Workforce management software can help protect you in the event of an audit. Professional payroll services can help you avoid employee challenges. Together these systems can keep your company afloat when challenges arise. Improper employee classification is a common payroll pitfall. This is a simple problem to avoid. It’s amazing that this is a common reason for business failure, but it is. The “exempt” refers to overtime protections. Non-exempt employees earn overtime when they work more than 40 hours a week. Exempt employees don’t earn overtime. Improper classification of an employee can result in fines or non-compliance penalties. Employees might not receive credit for the right pay scale, resulting in a short paycheck. Complicated classification requirements can result in missed steps. For instance, it is a common misconception that employers can decide classifications. In reality, a job title is meaningless but job roles are important. It’s the job duties and relationship that count. Paying a worker a salary doesn’t cut overtime requirements. Even large corporations misclassify. Sometimes they do this to avoid paying overtime, minimum wage, and employee benefits. Avoidance strategies can get you into trouble. It’s a good idea to have trusted professional payroll services to guide you to a solution. One notorious example of this is insurance giant MetLife. MetLife changed the classification for a position even though the duties didn’t change. The mistake cost them $50 million dollars in penalties and back pay. FedEx experienced an even bigger problem. They paid a $240 million settlement for misclassifying drivers. Both companies experienced an employee disconnect that cost them big time. Employee complaints grew into regulatory scrutiny. In either case, the companies could have avoided fines and penalties. The lesson learned is that there can be a significant penalty when payroll is in question. Improper employee classifications can cascade into larger problems and can capsize your company. Don’t let misclassification be the reason your company fails. It’s easy to avoid this problem. As a small business owner, you know by now that ignorance is not an excuse recognized by the law. Claiming you “forgot” will only make matters worse. Insulate your business from employee classification problems. An easy way is to incorporate job roles into your workforce management software. Your workforce management software allows you to schedule based on job role. You won’t have to worry if your job roles include accurate classifications. Job roles can help you enforce regulatory scheduling requirements. They can also help you maintain proper employee classifications. Scheduling with job roles assures you are in compliance and covering skill requirements. Ask your payroll services provider for help in setting up your employee classifications. Assign job roles to employees based on classifications. Set up scheduling alerts to automate the process of compliance assurance. Cashflow can sink your business before you even get started. Without cash flow, your payroll will starve. Many of the problems we have discussed have roots in cash flow. When funds are low, owners and managers can become desperate. Cutting corners and making ends meet outside of convention results in payroll problems. When you delay payroll taxes because of a cash flow pinch you place your company in jeopardy. Scheduling and time and attendance can have a huge impact on cash flow. Unplanned overtime can sink a business without you even knowing. Overstaffing can drain your budget when income doesn’t match the resources. Workforce management software with integrated scheduling can help you avoid these problems. Efficient time and attendance management can help you shave time and increase productivity. With workforce management software doing the heavy lifting, you can optimize your cash flow. Limited cash flow means you have to run a tight ship. You can’t run a tight ship if you aren’t watching the numbers. Workforce management software can help you watch the numbers. In real time. Your payroll services manager can watch, too. Even if they are working from a remote location. Everyone can be on the same page for scheduling and time and attendance. Scheduling, time and attendance, and integrated payroll can work well together. When they do, they can save you a lot of time and money. They can also optimize your workforce so you aren’t spending more than you can afford. Scheduling templates can help you standardize your workforce. Online shift swapping can help you fill gaps in a hurry. Alerts can warn you of unplanned overtime. All these and more can help you focus on cash flow optimization. When payroll services and workforce management software work together, your business stays afloat. With good management and oversight, you will find they can help you thrive. Your business might not make it. That’s a fact that will keep you up at night. But you have the tools and know-how to avoid the top problems associated with payroll, and that’s a big head start. Your business should rely on a trusted payroll services provider. These providers focus on the details while you focus on your business. It’s a well-seasoned relationship, and time has proven over again that this is a match made for success. Workforce management software plays a critical role in the success of your business. Software tools help you add efficiency to your management process. Optimizing your workforce with cloud-based technology improves your performance. Improved performance will give you a competitive edge. It will also help you avoid the points of failure discussed in this article. Avoid human error with integration between workforce management software and payroll services. When these two systems work together, there are fewer opportunities to make mistakes. Stop missing deadlines by planning ahead. Ask your trusted payroll services provider for help identifying areas to watch. Depend on your workforce management software to collect and store the data. Leverage both systems for quick responses to deadlines and future planning. Seek advice from your payroll services provider on new laws and regulations. Take advantage of cloud-based workforce management software. It is always up to date with current compliance and regulatory reports. Keep good records that your payroll services provider can access 24/7. Prepare for audits with real-time reporting. Brace against employee challenges with employee self-service. Access to current data can resolve most issues before they become problems. Add employee classifications to your job roles. Use workforce management software that will allow you to schedule with job roles. Clarify your job role assignments with your payroll services provider. Make job roles and employee classifications the heart of your time tracking system. Leverage the benefits of online workforce management software to increase cash flow. Work with your payroll services provider to optimize scheduling and shift planning. Watch alerts for unplanned overtime and overstaffing expenses before they occur. WorkforceHUB features advanced payroll integration. This helps you avoid human error and optimizes your time. WorkforceHUB includes compliance features to help you avoid legal trouble. Instant reports and historical tracking help you stay ahead of deadlines. Built-in regulatory reports help you meet compliance standards. Historical tracking and record keeping will help you in your next audit. Real-time access to data means you always have the right reports at your fingertips. Your payroll services provider can access them, too. From anywhere. Employee classifications and job role tracking are both parts of WorkforceHUB. Overtime alerts and schedule templates will help you leverage job roles to optimize. WorkforceHUB includes all the tools you need to operate a successful business. All you need to add is your capable leadership and the help of a qualified payroll services provider.